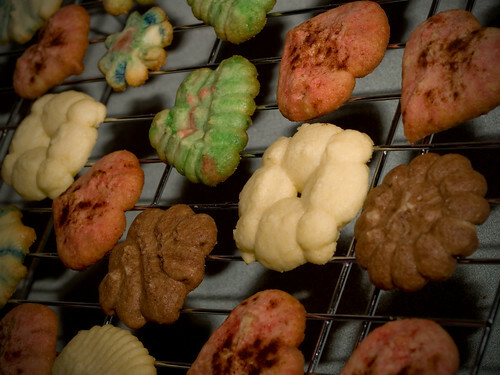 Almost every year I make a batch of spritz cookies. I have been using Betty Crocker's Ultimate Spritz recipe. I usually separate the dough a few times and add different food colorings. I even added a little cocoa powder to some one year and they turned out pretty good. Mom used to make them every year when I was a kid too. It was fun making them then and still have fun making them now. I always have a hard time choosing which templates to use. I'm tempted to make two batches so I can make a few of each one, but never do. I bought fresh cranberries this year for the first time and they were actually quite tasty. I made cranberry sauce for Thanksgiving. 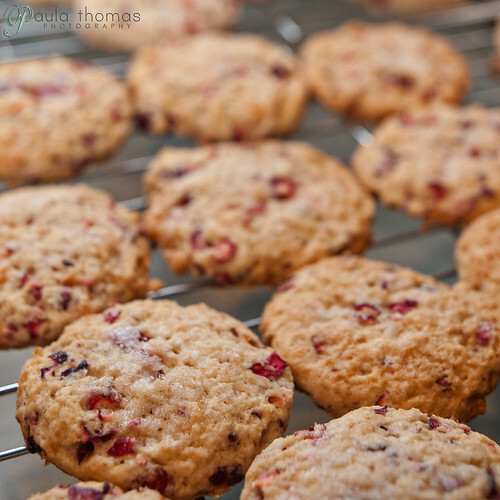 I decided to buy another bag of cranberries and try some more recipes with them. I found a recipe for cranberry scones that sounded good and got good reviews on thekitchn.com. They weren't kidding, the dough is very sticky. I had never made scones before so wasn't sure what to expect. The recipe says to just dump the dough out on a floured surface and cut out circles using the top of a jar or a biscuit cutter. Not having a biscuit cutter, I used a jar. The recipe didn't really say anything about spreading out the dough or how thick it should be. So I had to guess on that. I just spread it out until it was about a half inch tall and then started cutting out circles. They turned out looking more like cookes than scones but that's ok. They taste like scones and they were nice and small. I still have a half a bag of cranberries left and trying to decide what else to make with them. I wonder how cranberry pancakes would turn out. Cranberry Orange muffins usually are pretty good?